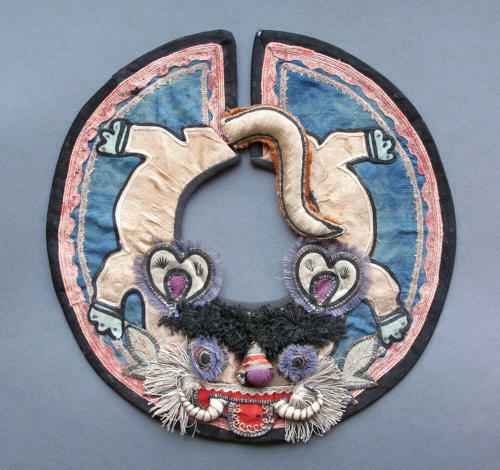 A charming Chinese silk collar for a child, formed as two lion-like creatures at the back, with the tail of one of them closing the collar, and a ferocious mythical creature mask to the front. The tail, and the nose & tusks of the mask, are padded. This collar dates from the early Nineteenth Century. Diameter of collar is 24cm / 9.4". It is likely that the ferocious animals on the collar were designed to keep evil spirit at bay and to protect the child who wore it. The collar is in good condition with some sunlight fading to the blue background silk, and probably also to the pink border of the collar. One or two small areas of wear to the black border of the collar. Some losses to the black threads at the side of the nose of the animal head. Staining to the back of the collar (please examine our photographs).